This cute bunny canvas was my reward for stitching a very large tropical fish canvas! 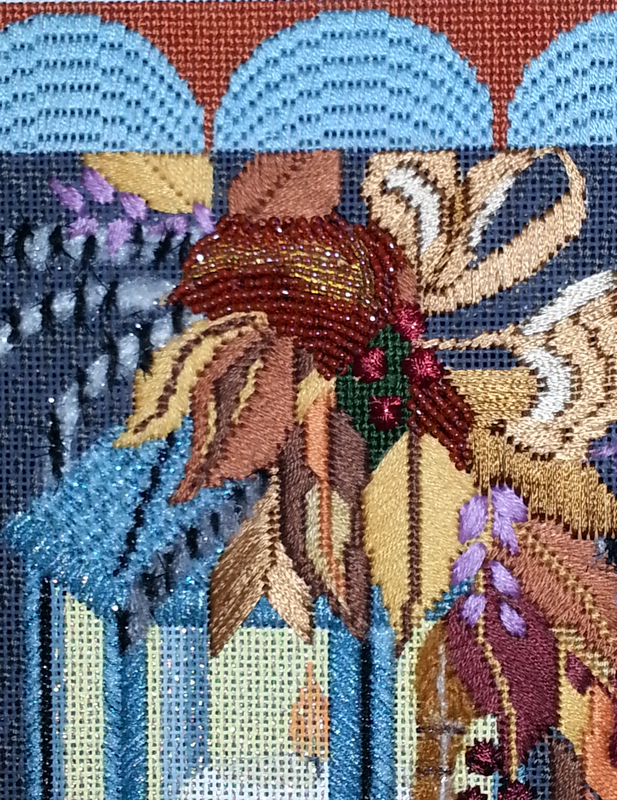 I stitched the basket stitch at the bottom with 2 different Gloriana silk floss colors- one for the vertical stitches, and the other for the horizontal stitches. 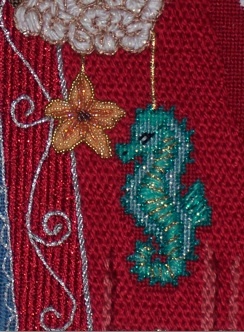 The tulips are stitched with 4mm River Silks ribbon. 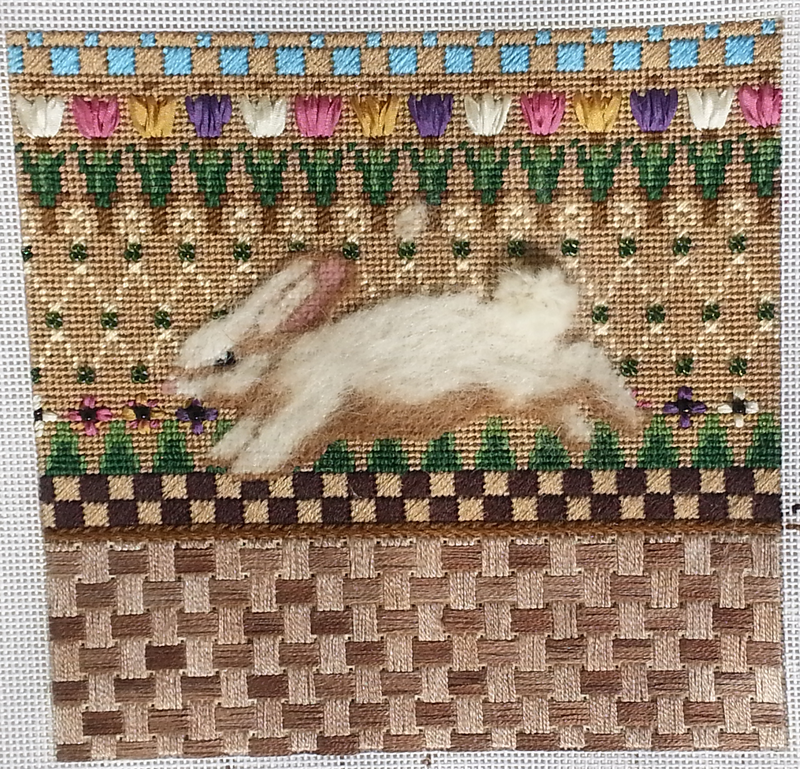 For the bunny’s body, I stitched basketweave with Alpaca 18. If I had to do it again, I would use Encroaching Gobelin. Basketweave left a lot of bulk on the back of the canvas and the front a little threadbare after brushing it with my bunka brush. I can’t wait to have this made into a pillow for my spring collection! 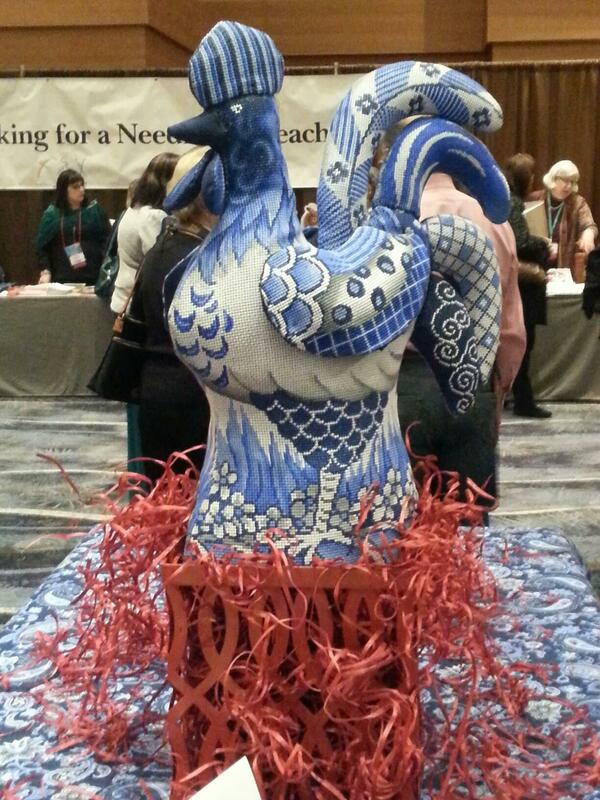 Check out this fabulous rooster from Patti Mann! It’s available in several different colorways and patterns. Stitch one of these and it’s like having a rooster without the upkeep or the noise! 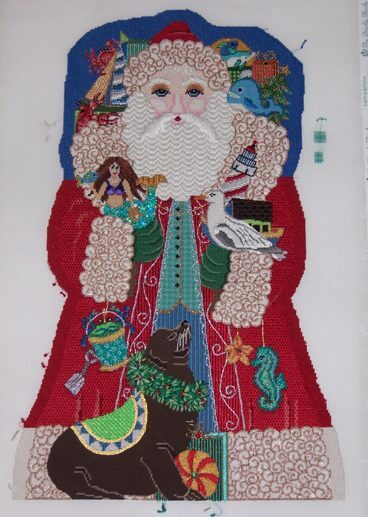 I enjoyed two wonderful classes yesterday, both taught by Sandra Arthur. 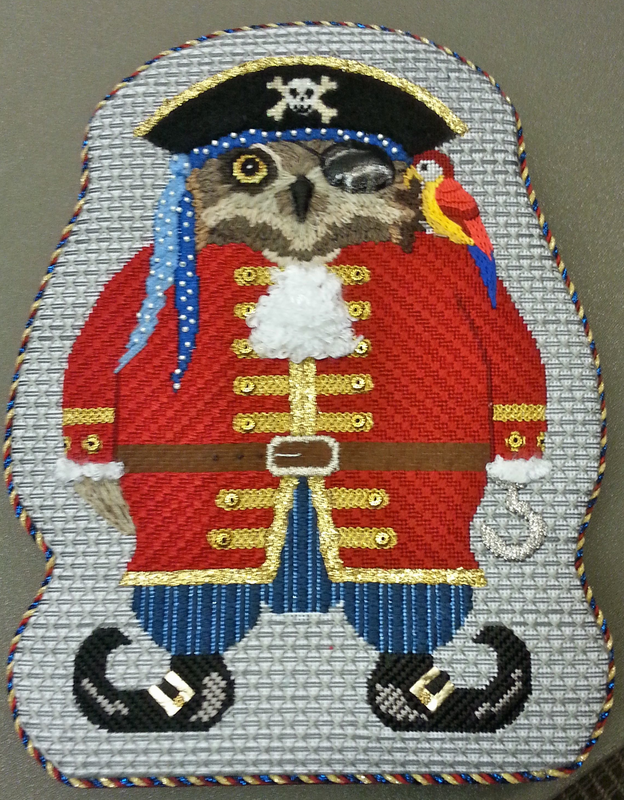 The first was the Captain Blackbeard canvas by JP Needlepoint. Sandy wrote a terrific guide and the finished canvas is too cute. I learned a new stitch, Pekingnese and a really cool trick for creating paper templates for appliques. Also new to me were the Planet Earth thread Furr Fuzz Funn, Kreinik’s kid leather and new metallic embellishments from Sundance. JP also has a wench canvas that I will have to have. 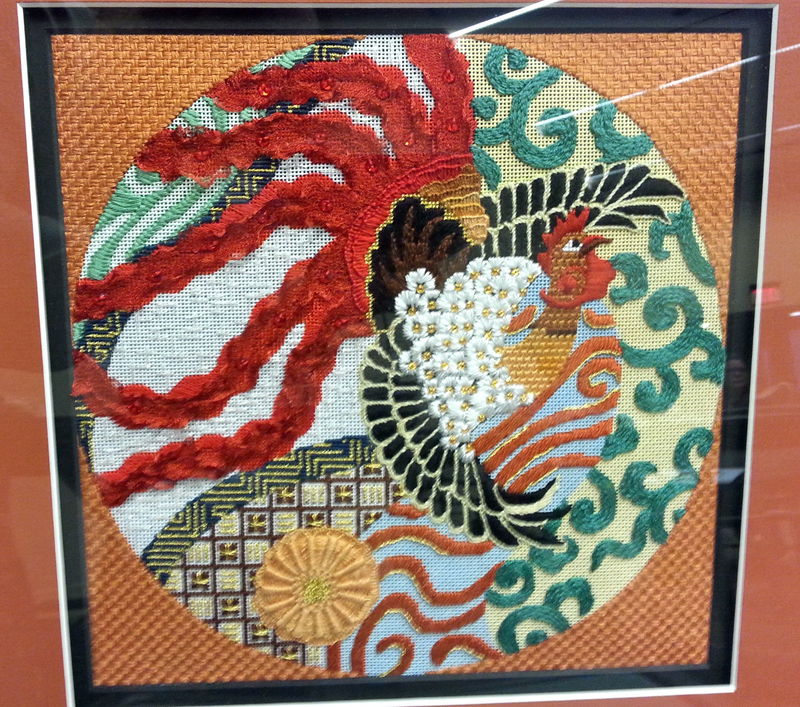 My second class featured the Flaming Fowl canvas by Leigh. The finished canvas is simply stunning. I have a new favorite stitch– Reverse Chain and I learned an or nue’ variation. 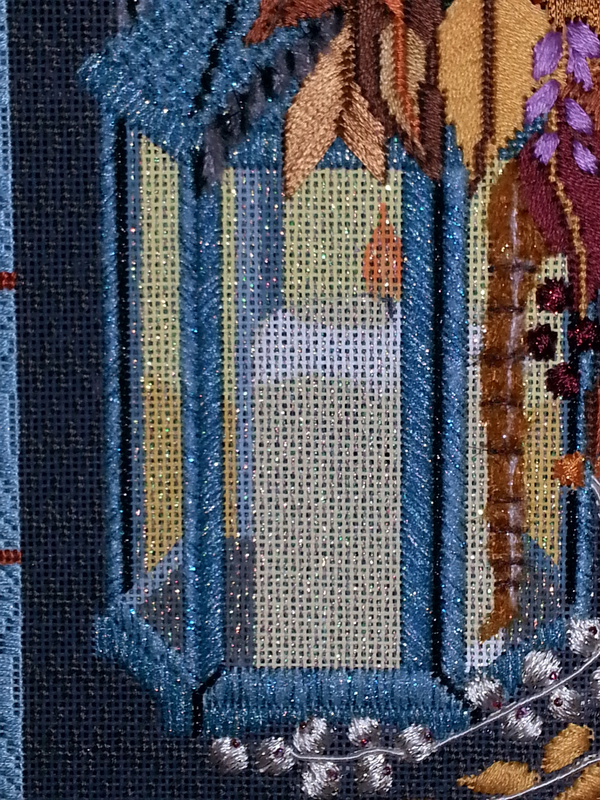 My new favorite effect was the use of Wonder Ribbon and crystals from The Collection for the tail feathers. Market opens this morning and I can’t wait to see what is new! It’s so easy to choose favorites from this trunk show! It leans heavily towards the Christmas/Halloween/Easter side of things- and we all know how I love a good holiday! These are the canvases I want to take home with me, or click here to view the whole trunk show. Thanks for checking in on us! For our final post on our favorites from the CBK Artists trunk show, it was a toss-up between these two canvases. So we decided we’d just post both of them! 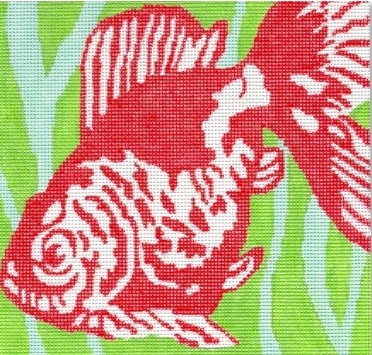 First up is this brightly colored fish; the fantastic colors really caught our eye. 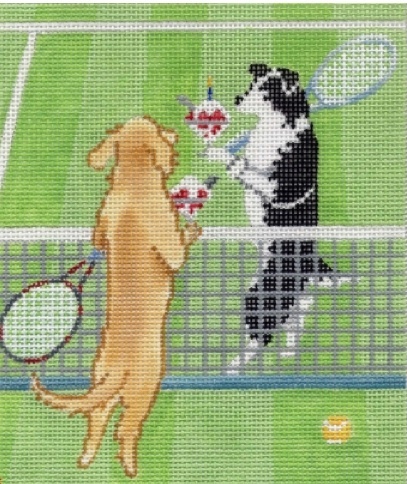 And next, we have two very sophisticated dogs, playing tennis, of course.